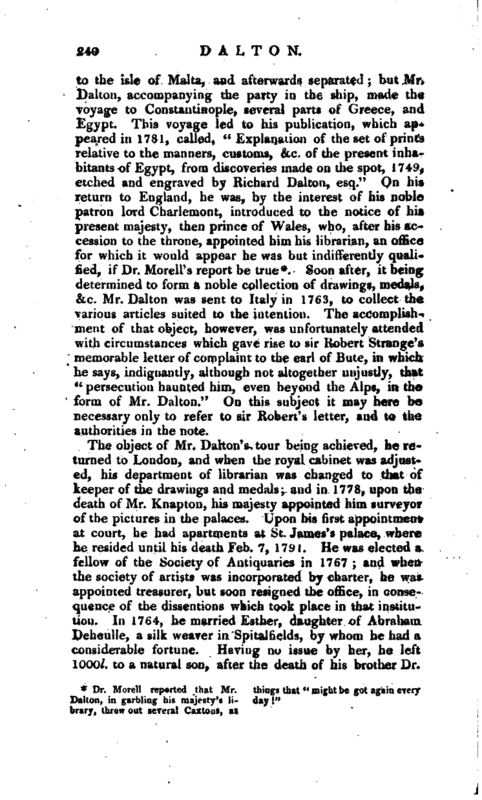 Soon after, it being determined to form a noble collection of drawings, medals, &c. Mr. Daltou was sent to Italy in 1763, to collect the various articles suited to the intention. 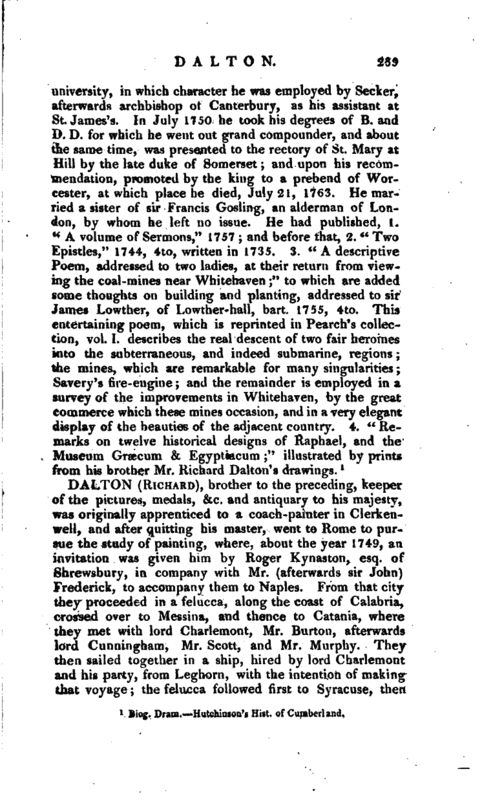 The accomplishment of that object, however, was unfortunately attended with circumstances which gave rise to sir Robert Strange’s memorable letter of complaint to the earl of Bute, in which he says, indignantly, although not altogether unjustly, that “persecution haunted him, even beyond the Alps, in the form of Mr. Dalton.” On this subject it may here be necessary only to refer to sir Robert’s letter, and to the authorities in the note. 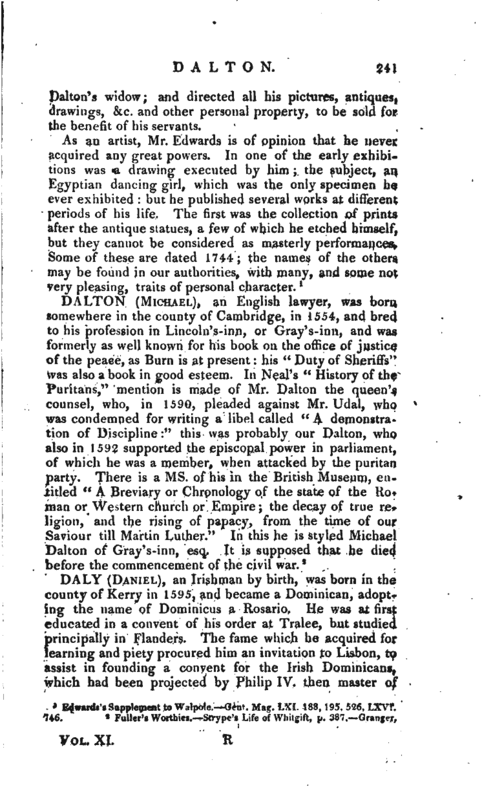 The object of Mr. Dalton’s tour being achieved, he returned to London, and when the royal cabinet was adjusted, his department of librarian was changed to that of keeper of the drawings and medals; and in 1778, upon the death of Mr. Knapton, his majesty appointed him surveyor of the pictures in the palaces. Upon his first appointment at court, he had apartments at St. James’s palace, where he resided until his death Feb. 7, 1791. He was elected a fellow of the Society of Antiquaries in 1767; and when the society of artists was incorporated by charter, he was appointed treasurer, but soon resigned the office, in consequence of the dissentions which took place in that institution. In 1764, he married Esther, daughter of Abraham Deheulle, a silk weaver in Spitalfields, by whom he had a considerable fortune. Having no issue by her, he left 1000l. to a natural son, after the death of his brother Dr. | Dalton’s widow; and directed all his pictures, antiques, drawings, &c. and other personal property, to be sold for the benefit of his servants. Edwards’s Supplement to Walpole. —Gent. Mag. LXI. 133, 195, 526, LXVI. ^46.